Almond milk is a plant-based beverage derived from almonds, and is among the most popular vegetable milk products in the United States. Almond milk is made from blending almonds with water and removing the solids from the mixture. The beverage is characterized by its creamy consistency and nutty flavor. It is generally lower in fats and calories compared with regular cow’s milk. According to an article posted on the health and wellness website Live Strong, the beverage has become a staple for people who avoid dairy. Almond milk is available in many grocery stores, and come in various flavors and brands. Almond milk is an excellent source of essential vitamins and minerals that the body needs for proper function and disease prevention. Below is a list of important nutrients found in almond milk. While not as dense as regular cow’s milk, almond milk is also relatively high in calcium and other essential minerals that boost bone strength. In fact, almond milk provides 30 percent of the daily recommended intake of calcium, and about 25 percent of the suggested vitamin D intake. This makes almond milk an ideal food fare against arthritis and osteoporosis. Almond milk is also notably effective in promoting muscle growth. The superfood is packed with iron and riboflavin that improves muscle strength. Additionally, the high riboflavin supply in almond milk is shown to alleviate and prevent migraines. Almond milk is especially beneficial for body builders who want to increase muscular strength. Almond milk is known for its cardiovascular benefits too. The popular beverage does not contain cholesterol and saturated fat and as a matter of fact is an excellent source of omega-6 fatty acids that mitigate the risk of developing high blood pressure and heart disease. Likewise, the drink’s low sodium content and high potassium levels help improve the body’s cardiovascular profile. The superfood is also valued for its positive effects on the digestive system. Almond milk is loaded with fiber that helps facilitate the digestive process. The beverage does not contain lactose, which makes it especially beneficial for people who have lactose intolerance. It contains significantly fewer calories compared with whole and skimmed milk. Thus, the drink may serve as a healthy dairy alternative to promote weight loss. In addition, the superfood is relatively low in sugar; almond milk has a low glycemic index and can be readily absorbed and used by the body. This makes it a perfect drink for patients with diabetes or people looking for low-sugar milk. Aside from this, almond milk is loaded with vitamin D that boosts cell function and immunity. The abundant vitamin D supply in almond milk is also touted to reduce the risk of developing Alzheimer’s disease. Almond milk’s bone-enriching properties are particularly beneficial to the skeletal system. Likewise, almond milk is known to support the muscular, digestive, immune, and nervous systems. Almond milk is a versatile ingredient that is commonly used in a variety of beverages such as smoothies and milkshakes. Almond milk is also an excellent alternative to dairy in cream-based products such as ice cream and baked goods, among others. An article posted on The Huffington Post website features some of the most interesting recipes for almond milk. 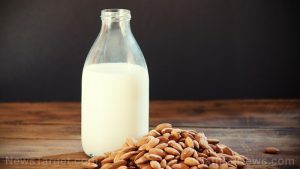 Likewise, online recipe generator FoodAndWine.com has curated various almond milk recipes. Almond milk prevents arthritis, osteoporosis, Alzheimer’s disease, and cardiovascular issues. Almond milk improves muscle strength, diabetes management, and digestive issues. Almond milk is beneficial to the skeletal, muscular, digestive, immune, and nervous systems.